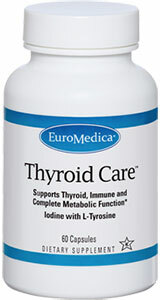 Thyroid Care™ provides superior nutritional support for healthy thyroid and immune function. Optimal levels of iodine benefit the thyroid gland and supports healthy metabolism. L-Tyrosine is an important amino acid that is necessary for the body to produce thyroid (as well as noradrenaline and dopamine) hormones. It is impossible to have a well functioning thyroid without sufficient quantities of tyrosine and iodine, either in the diet, or through supplementation. Recommendations: 1-2 capsules daily on an empty stomach, or as recommended by your healthcare practitioner.